Do you really need a barista certificate? There is hardly a week that goes by where I don’t receive an email asking me whether or not we provide barista certificates or whether we provide the Australian Government accredited SITHFAB005 (formerly SITHFAB204) Prepare and Serve Espresso Coffee certification. Are these certificates necessary to gain employment as a barista if you’re starting out? The short answer is no, but it’s not so simple. Whether or not a school is an RTO/accredited has virtually no impact on your future job prospects and should not impact your decision on choosing that particular course or school. Your decisions should be based on reputation of the school, qualifications of the trainer, and what graduates have gone on to do in the industry. To be frank, the industry, i.e. cafes, do not care whether or not you have a piece of paper from an RTO stating you’ve completed a barista course. They’re more interested in you as a person and what you can do behind the machine. A TAFE certificate or similar qualification will only get your foot in the door – A CERTIFICATE WILL NOT GUARANTEE YOU A JOB – anyone who tells you otherwise (I’m calling out right now) is a liar! Think about this scenario: it takes about 3 years for most undergraduate Bachelor degrees to be completed, after which you’ll be conferred your degree with a thousand other graduands receiving the same qualification. And that’s just from one university! Time to head out into the real world and put that degree to use. So you search online and apply for a bunch of jobs. Only one place gets back to you and requests an interview. You think you killed the interview and tell your friends you crushed it. You’re sure you got the job. A week later you get a phone call from HR telling you that you were unsuccessful. After a brief conversation, you find out that there were 50 other candidates all applying for the same position who have the same qualification as you. Ok, whilst I am not implying getting a job as a barista is anywhere as arduous or difficult as finding a graduate position in a company, the take-home message is clear; every other graduate has the same qualification as you. Most fall short of the mark, and only a small handful get the job. At the end of the day, the piece of paper stating your certification is just that. A barista certificate doesn’t tell your prospective employer about who you are as a person; your attitude and personality traits. In the hospitality business, a can-do attitude, a willingness to learn and a bright personality are essential. After all, the hospitality business is a people business. Do you know what happens to your nice resume, barista certificate and cover letter you spent hours on for the job application? It’s read for about a fifth of the time it takes to extract an espresso before it goes in the bin! I’ve even been guilty of this. Sure that’s bad, but if you want to impress me, make me a coffee! In fact, that’s how most hiring is done in cafes these days. They’re more interested in who you are as a person and whether or not you have the potential to make great coffee and not what 4 pieces of paper say. Do we provide barista certificates? Yes, of course, all students are issued with a certificate upon completion of their barista courses. Does it matter? Absolutely not! 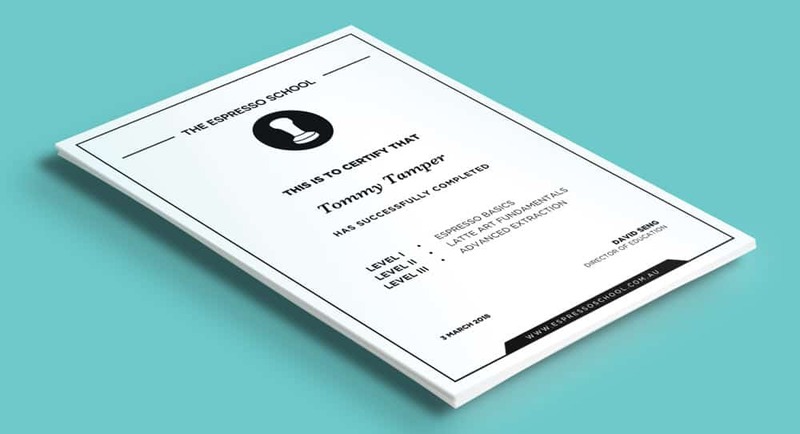 Use the certificate as a launching pad for your career to get your foot in the door. Dazzle your prospective employers with a great attitude and a voraciousness to learn. That’s all for now. Good luck to you and if you have any questions, shoot them through in the comments section below! The Espresso School is a specialty coffee school delivering Australia's most progressive barista courses in Melbourne. Where do I go to print my certificate off? Hi Abby! Firstly you have to fish the email and certificate out of your spam/junk folder in Gmail. After that, you’ll find some helpful hints of what to do with your certificate.